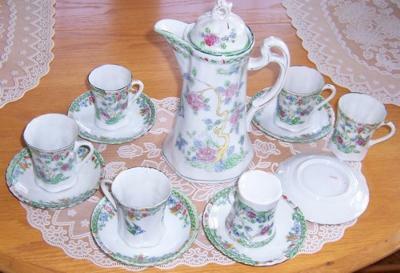 This Chocolate Pot Set is marked ‘Japan’and was bought from an antiques shop in Vermont. I am not sure if this really is a chocolate pot or what it is made of. It would be interesting to find out something about this as it seems to be an odd little set. The pot is faded more than the cups and all the pieces seem crudely made to me. There are 6 cups and 6 saucers. 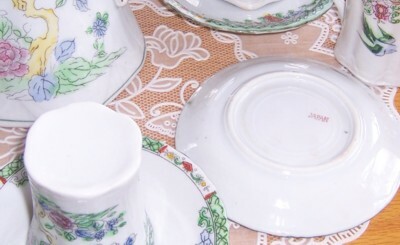 The cups are unmarked on the bottoms, the saucers are marked with the word Japan and the pot is marked Japan on the bottom also. 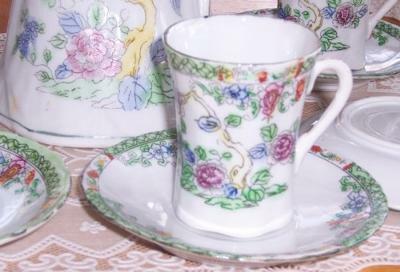 It is a floral design and has a line drawing of a bird on one side of each cup and the floral design on the other side of each cup. I purchased the chocolate pot set at least 10 years ago at an antique shop in Vermont. I have no recollection of the amount I paid for it, but it was not much. I wonder if it has any value as it almost seems to be something made for a child as a quickly manufactured, inexpensive play set or a cheap tourist item. If anyone can offer any advice, I’d be very grateful.